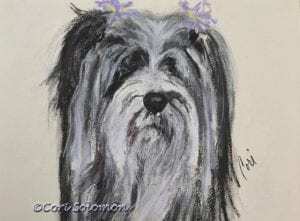 This pastel drawing called Sydney depicts a Tibetan Terrier that I photographed at Westminster in 2012. The drawing was a nomination for an award for excellence in the category of Graphic – Single Illustration or Painting at the Dog Writers Association of America 2013 Annual Writing Competition. Sydney was also the inspiration for the article I wrote called “Sydney Was Supposed to Die — Not Win Awards at Dog Shows”. She survived a bob-cat attack to become a national champion. To read the story I wrote about Sydney click here. To Purchase the drawing of Sydney email Cori.